Kids in Biz has upcoming events titled "Kids in Bizville"
​In June 2009, 14 youth from Monmouth and Ocean Counties at the Jersey Shore, participated in the first Kids in Biz Initiative in Neptune, NJ. These wonderfully enthusiastic children, learned how to count money, developed products ( including soy candles), packaged, marketed and showcased their products selling them to raise money to buy things for themselves or treat themselves out to the movies. This was an experience they will take with them for the rest of their lives. 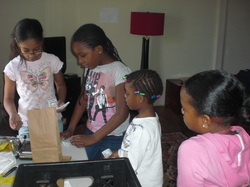 Youth that read the Kids in Biz book and participate in the program are inspired to greatness. They are "diamonds in the rough".